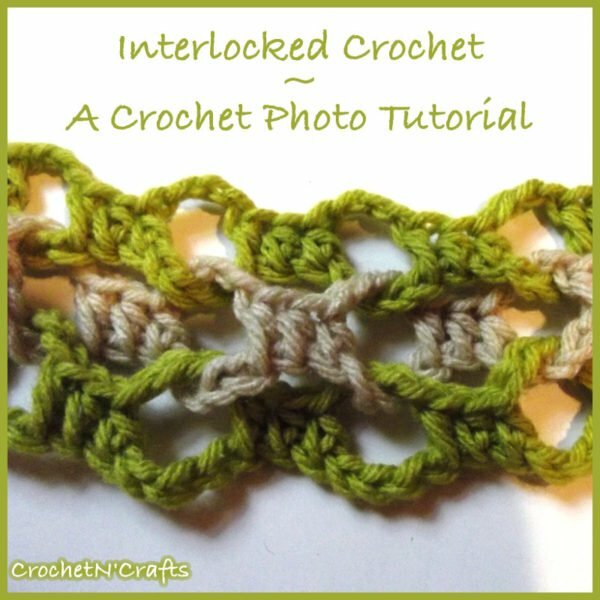 Interlocked crochet stole my heart the very first time I saw it! 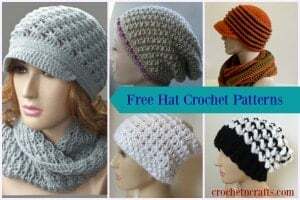 It’s great for scarves and cowls, belts, market bags and who know what else! 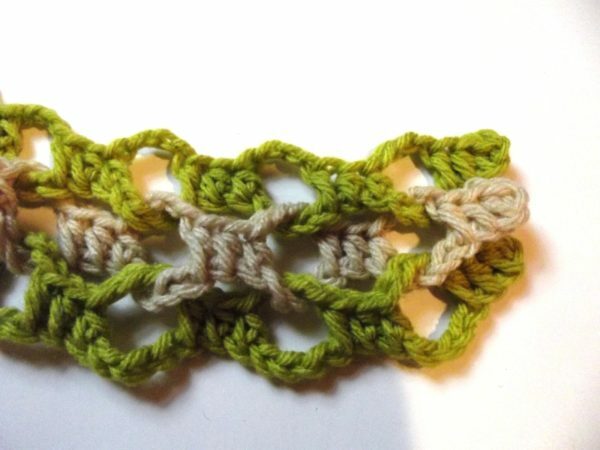 I havn’t had a chance to crochet with it much, but I’m hoping to have some fun with it. 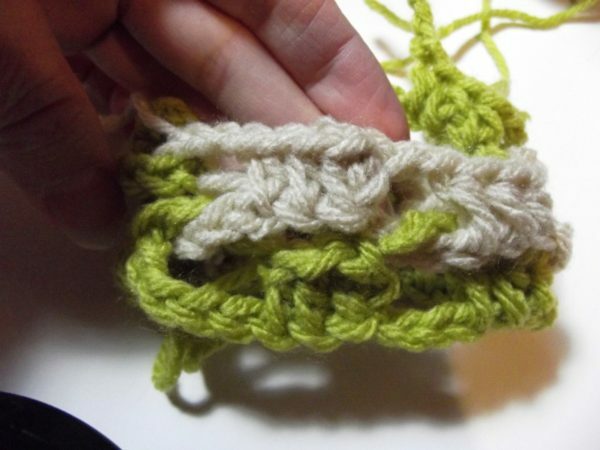 The fabric is totally different than regular crocheted fabric due to the amount of loops it contains. You can basically shrink it down to nothing or expand it super wide. It may look difficult, but it’s actually very easy to do. 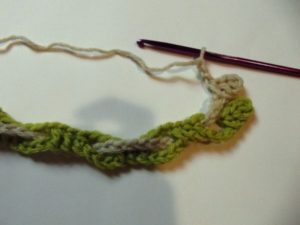 However, I found that it requires a bit of patience when it comes to weaving in the chains and then having to work on both sides of the fabric. But the finished outcome is rather pretty and well worth the minor annoyance. 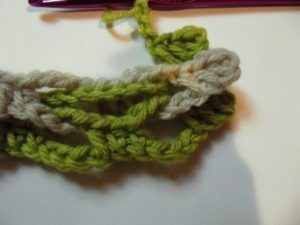 Step 1: If you havn’t already got a base, make some chains to get started. 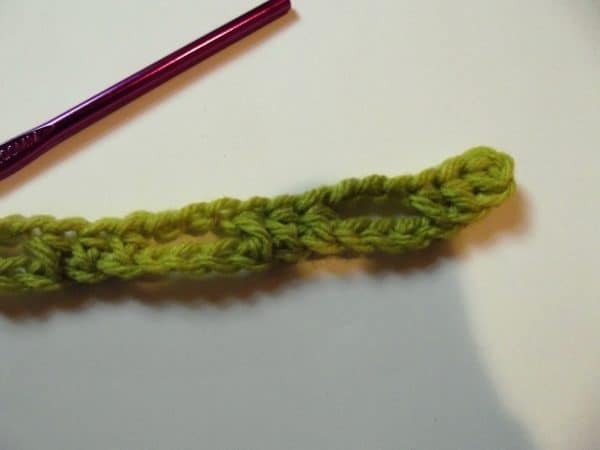 Step 2: You can use pretty much any stitches that you want, but for this tutorial I worked a half double crochet into the second chain from the hook. Again, you can crochet into as many stitches or chains, but I only made 3 half doubles, followed by a chain 3. Step 3: Continue that across, working into 3 stitches, chain 3, and then skipping 3 stitches. You can make up your own numbers here, but the general rule is to chain as many chains as you are skipping below. Step 4: Fasten off after each row or round, and start again with a new chain, same as in step 1. 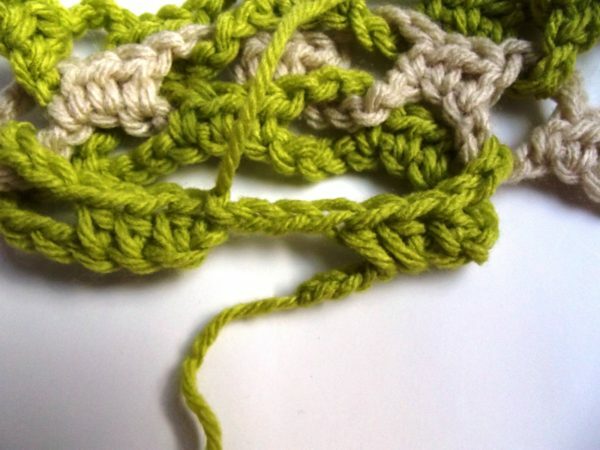 Step 5: Weave the chain through the spaces of the previous row. Step 6: Follow the same pattern as before where you work 3 half doubles, chain 3 and then skip 3. Step 7: Basically you rotate between working 3 stitches at the front and three at the back of the fabric. Step 8: When you go to weave the third row, make sure to weave it the same direction as the first row. Notice how the green in rows 1 and 3 falls below the first column of row 2, and then both rows come out to sit above the second column of row 2. An easy way to remember is to start odd rows on the bottom (back) of work, and even rows at the front. But there is no right or wrong in crochet, so you could just as well start them all from the same side. However; that would give you a slightly different look. Step 10: You can work the interlocking stitches in rows or in rounds. 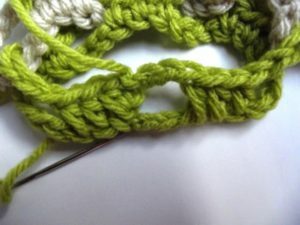 If working them in rows, make sure to begin and end the row with stitches. However, when working in rounds you want to end with chains in order to give you that last chain-space. 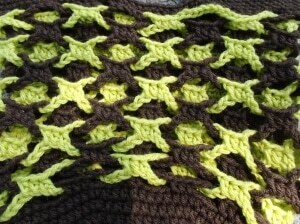 In my case I made an extra 3 chains and also had 3 chains left on the bottom, which I did not crochet into. 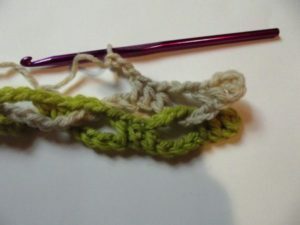 Then join the round with a slip stitch in top of first half double crochet. 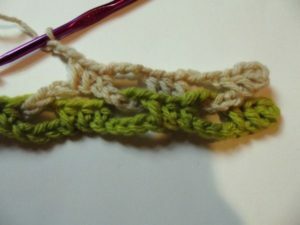 Step 11: Take the tail end of the starting chains and join it to the bottom of the first stitch. 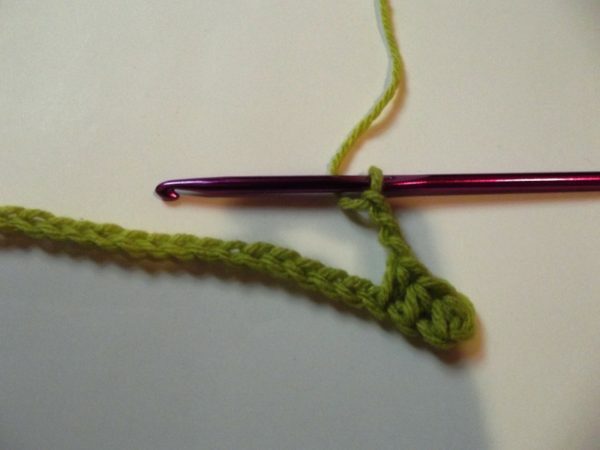 I used a yarn needle and just secured it that way. 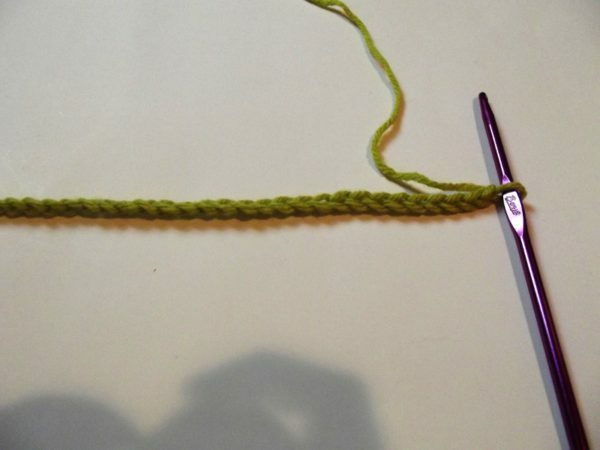 Step 12: Follow the same steps for joining in following rounds, but make sure to weave the ends as necessary. It’s best to join each round as you go to make it easier. Step 13: Here you see 2 rounds joined. So that’s it! That’s all there’s too it. 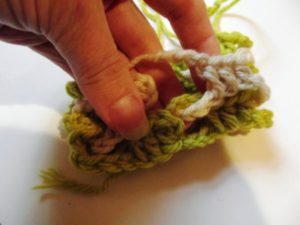 Below is another picture of a market bag that I crocheted using this technique. And you can see the columns it creates in the two colors. 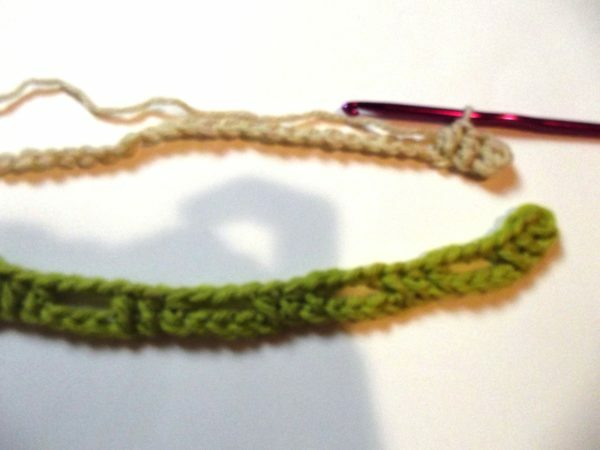 Hope you’ll have fun with this stitch.